Mark your calendars. April 29. Free Press-Fair Trial. 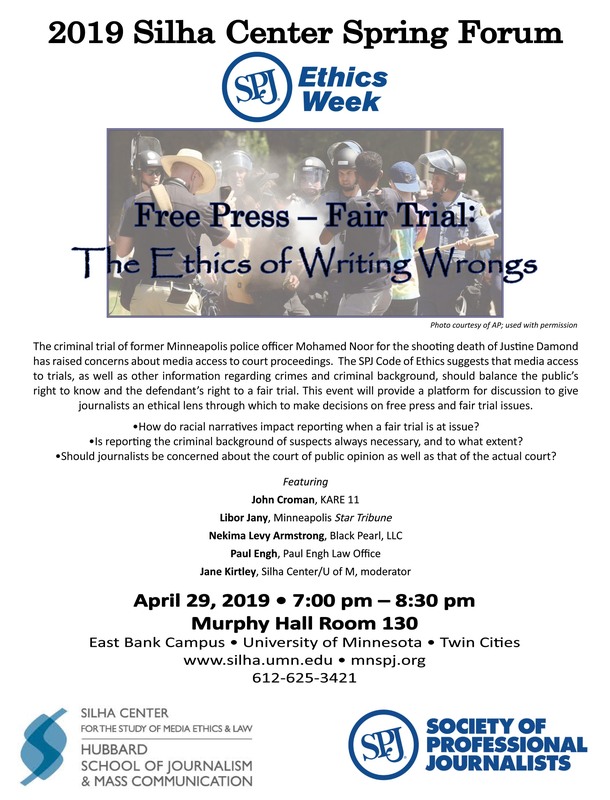 MNSPJ partnering with the University of Minnesota Hubbard School of Journalism & Mass Communication 7 p.m. to 9 p.m. Murphy Hall on the U campus. Implications for journalism of court restrictions of the Noor trial and other pressing issues. The Minnesota Society of Professional Journalists calls on elected officials who block the public and journalists from their social media accounts to immediately cease and desist this affront to the public’s right to know. Minneapolis City Council Member Alondra Cano has blocked access to her Twitter account to journalists who have reported critically on her public record. MNSPJ calls on Cano and others to immediately allow full access to their social media accounts as required by the Minnesota Open Meeting Law. Continued blocking by Cano after an initial incident last year led MNSPJ to petition the Minnesota Data Practices Office for a ruling on Cano’s Twitter blocking that we believe falls short of legal requirements of section 13D.065 of the Open Meeting Law. While MNSPJ is disappointed the Data Practices Office did not rule in what appears to be a clear-cut violation of the law, the office followed its new strategy of mediation and spoke to Cano’s representative relaying MNSPJ’s concerns. Cano has now described her Twitter account as a “personal account,” while the city of Minneapolis apparently is devising a policy on the issue. A number of journalists remain blocked. Numerous federal courts have struck down the practice of elected officials blocking access to their social media accounts. In January 2019, the U.S. Court of Appeals for the Fourth Circuit affirmed that a county official who blocked a critic from her Facebook Page violated the First Amendment. In May 2018, a federal judge also ruled President Donald Trump blocking Twitter users from his account was unconstitutional. Given the abundance of evidence that blocking the public from social media accounts operated by public officials is unconstitutional, we call on Council Member Cano and others to allow the public unfettered access to their social media accounts where they discuss the public’s business. 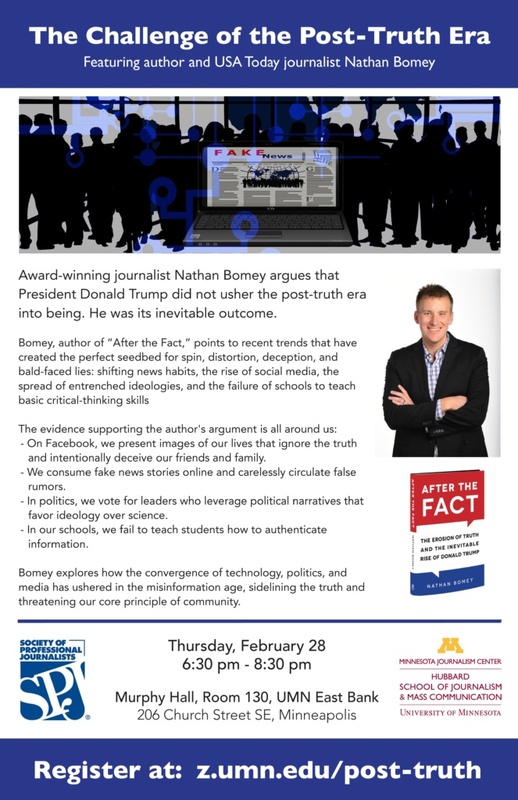 by Chris Snowbeck on February 24, 2019 in News with Comments Off on Challenges of Journalism in the Post-Truth Era — Event this Thursday! by Chris Snowbeck on February 24, 2019 in News with Comments Off on Submit Applications for MNSPJ Journalism Scholarship! Today is the day! It’s the last chance to enter MNSPJ’s Page One Awards to celebrate great journalism from 2018. Region 6 are you Ready? ?